Limited Stock: 6 left. Buy now from Amazon.com! 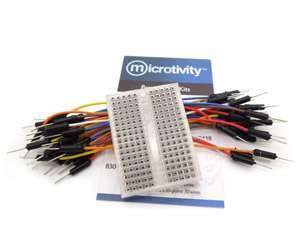 Features of our Mini Breadboard kits: The included jumper wires allow you to connect different components quickly. Wires come in several colors and therefore so it will be easier to tell which ones are which. The mini breadboard is best suited for creating small projects, to serve as a peripheral circuit of a larger circuit, and many other ways. They are also nice to be used in size-constrained circumstances such as being part of a artwork.